I have had some readers ask me about eShakti and my thoughts on the clothing. From what I gather, there is an apprehension from some (especially Western shoppers) on the East Asian ethnic style of many of the pieces from this web store. I, personally, have been very happy with what I have ordered from eShakti. And while many of the pieces seem to target a specific audience, a lot of the pieces are very wearable for even the most western styled of women. Another great option from this site is that they offer custom sized pieces for a small fee. Their sizes go up to a size 26. I recently purchased the Sash Waist Garthered Skirt for $44.95 from eShakti and I must say I really love it! From all the pieces I have ordered from them the material is of a high quality and their prices are very low, most pieces ranging from $40 - $80. This website is a gem of a find. Most of the pieces I have ordered have been very plain basic pieces that I can incorporate easily in to my wardrobe. The skirt I just purchased is very versatile and can easily go from work to night to weekend chic. I did remove the sash from the skirt. It just wasnt me. But with a pair of scissors or a seam ripper you can easily remove the sash and no one would know. Also, please forgive me, I am so over Winter...LOL! With this look I have on a strapless top from David's Bridal (it was a separate from a bridesmaid dress that I have found great use for), the high waist skirt from eShakti, a croped silk bolero and silver belt from Ann Taylor, necklace form H&M and silver shoes from Target. From this look I just removed the Bolero from Ann Taylor for an easy transition from day to night. All the remaining pieces remain the same from the day look. With this look, I just added a tank that I purchased from Target on Clearance for $2.50 (yes really) and a pair of American Eagle flats from Payless. Add a couple of pieces of your casual jewerly and your ready to run your weekend errands. 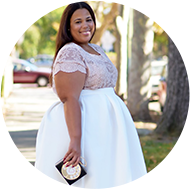 So I put my Curvy Girl stamp of approval on eShakti. Happy Shopping!!! i was one of the people who was afraid of this site before, but i really like that skirt. @thefatandskinny - you just have to know what to pick and if you are hesistate about the more ornate pieces go with something plain. Ack! I just got back from a vacation in St. Lucia and I had been looking all over for sundresses. I wish I knew of this site before! Am adding it to my favorites. Thanks! Wow, you do a great job with putting all the looks together. Love the skirt, and now I'm anticipating pairing up different things with my seperate piece from David's Bridal, I'm in a wedding in April. The only thing is, is that its a red wine color. Great Blog! !